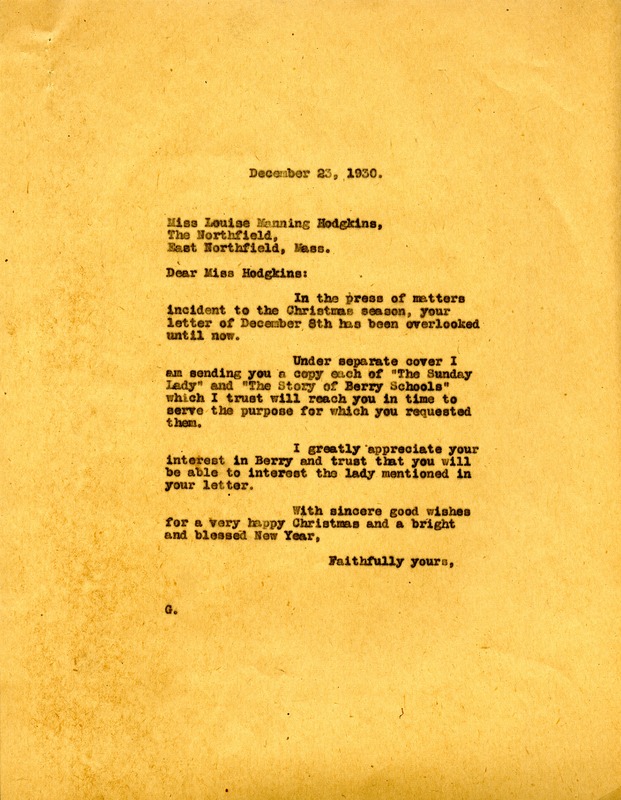 This letter is to Miss Louise Manning Hodgkins from Miss Martha Berry. Berry apologizes for the delay in answer, attributing it to the holiday bustle. She sends Miss Hodgkins "The Sunday Lady" and "The Story of Berry Schools" for her to use to interest a woman in the work of the Schools. Martha Berry, “Letter to Louise Manning Hodgkins from Martha Berry.” Martha Berry Digital Archive. Eds. Schlitz, Stephanie A., Chelsea Risley, Tanner Cahill, et al. Mount Berry: Berry College, 2013. accessed April 21, 2019, https://mbda.berry.edu/items/show/13276.